Store knitting needles and crochet hooks in this handy case that has many pockets in a variety of lengths and widths. Simply roll-up and button to store away. 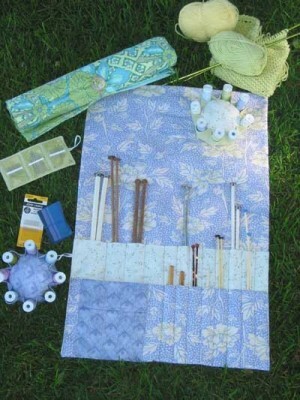 Pattern also includes a pincushion that stores eight spools of thread, and a storage case to hold three packs of needles.